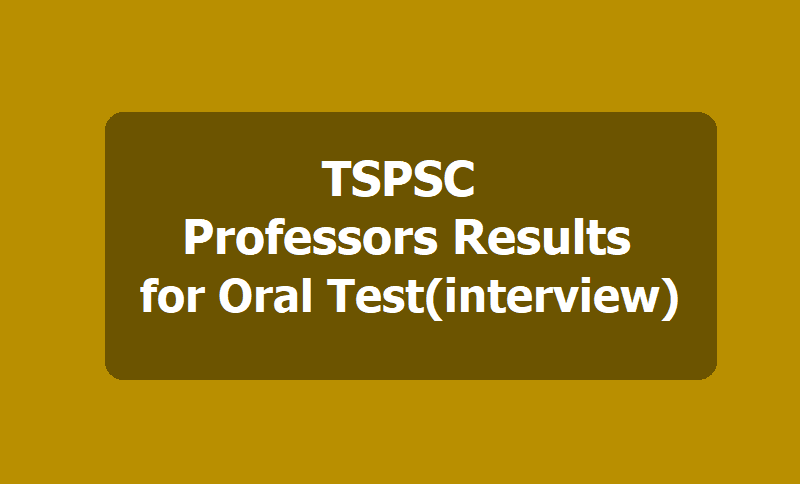 TSPSC Forest College Professors Results for Oral Test (interview), Schedule for interviews 2019: TSPSC informed that the list of provisionally selected candidates for Oral Test (interview) from 11/02/2019, for the post of Professors, Associate Professors and Assistant Professors in Forest College and Research Institute, Mulugu is available in Commission’s website i.e., (www.tspsc.gov.in), Candidates may visit the website for detailed day wise/ subject wise schedule for interviews. TSPSC has notified that, on the basis of the verification of certificates held on 09/11/2018, at O/o TSPSC, Prathibhabhavan, M.j.Road, Nampally, Hyderabad for the post of Professors, Associate Professors and Assistant Professors in Forest College and Research Institute (Mulugu), the following registered numbers have been provisionally selected for Interview vide Commission’s Notification No. 29/2018 subject to the following conditions. The candidates who have qualified for Oral Test (interview) are required to attend at TSPSC Office along with three(3) passport size photos on the relevant date and time as mentioned in the below schedule, candidates should report 9.00.A.M for morning session and 01.00.P.M for afternoon session. If on further verification it is found that any candidate is not eligible with reference to the particulars furnished by him/her in the Application form / Checklist / Certificates, the results of such candidate/candidates shall be cancelled at any stage of the selection process.